Today I captained the 54′ Ocean Yacht, Fin Addict, for a day trip trolling in the canyons. I saw on the sst shot that there was a break in the Baltimore Canyon, and with the lack of reports due to rediculously windy weather that seemed like the best option to me. We got to the 50 fathom line just inside of the tip of the Baltimore and first line in gets one of the most amazing wahoo bites I had ever seen. The fish are and Skyed out of the water easily over 6 feet high, and it was a nice fish. The reel screamed but after about 10 seconds the hook pulled. Major heartbreaker. We kept working the area and had a blue marlin swing and miss the right long rigger. Not a great start. We kept working the 50 fathom area since I was marking bait there and we had some life. Then there he is, white Marlin on the right long. Dropped back hooked up and line popped, no clue how. Wow, the day was really getting frustrating. Kept circling where the white was and there is another, but this time we released this white Marlin. Finally, broke the ice. We spent the majority of the day working the canyon walls and picking lots of Mahi off of the lobster pot balls. There were plenty of them out there today! We ended up snagging another white Marlin and got a quick release. Everyone was pretty happy with the day so we ran inshore to the Hot Dog trying to find a wahoo for the last hour but all we found was one dolphin. Beautiful day on the water as it got flat calm. The temp break was 69 and green water to 70.5 and blue to 72.3 and blue in the canyon. There were some pilot whales in the corner of the Baltimore Canyon but they were scattered and no tunas caught all day. We had a charter on the Low Profile yesterday (Sunday 9/21) for tuna and dolphin so we headed towards the water in the Wilmington. 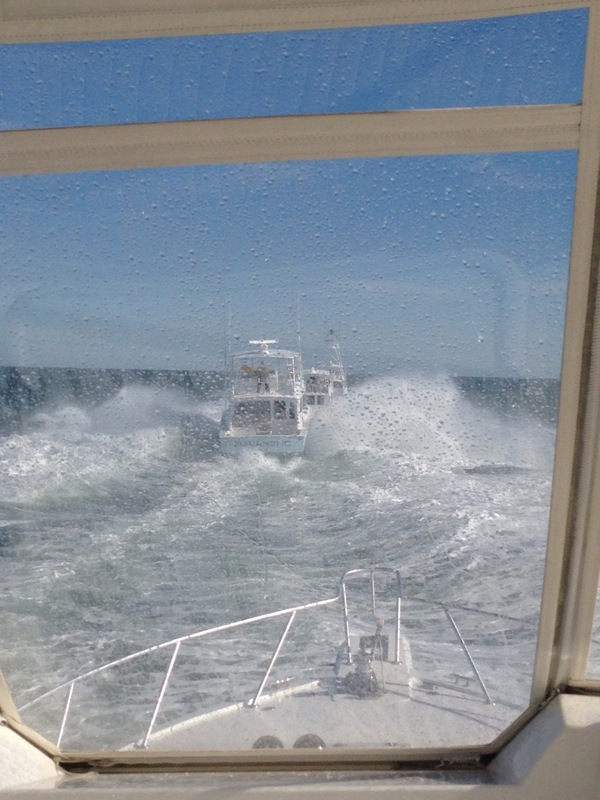 It was a rough ride out at 18 knots but we got to the East Notch around 6:15 and had lines in. The weed was so thick all along the east wall that is was nearly unfishable on the troll. We pushed out to 500 fathoms and lost a wahoo on the run and picked up a nice 60# yellowfin by 830 am. It was looking like we could scratch together a catch despite the weed situation. Then the wind got worse and the skies opened up to add to it and we had steady rain all day long. We picked up and ran but we didn’t get far before we saw sailor gulls wheeling around in a tight flock with skippies all over the surface underneath of them. We worked this for hours but no bites other then the small tunas themselves. We spent the last hour of the day hopping from lobster ball to lobster ball trying to scrape together a catch of dolphin on small spinning rods and we managed to get 20 of them. Luckily there wasn’t really anyone else out there so the pots were undisturbed and each held a few fish. As always, the challenge cup was a lot of fun. Unfortunately due to weather Friday was cancelled so it became a 1 day shootout on Saturday. We had a very slow day with only 1 lazy sailfish bite then an FU white marlin bite on the long rigger 30 seconds after time was up, haha. Cape May did win for the 3rd year straight and retired the existing Cup! Insure won the tournament catching 6 white marlin, Congratulations to them. We made our way home this morning from OCMD to Cape May in the 25 knot NE winds and 5-7 foot chop riding the Viking Train home at 20 knots. Thanks Viking Yachts!! We had planned to “fish down” today to Ocean City, MD for the Challenge Cup Billfish Tournament. We started our morning at 2 am with throttle issues but had them settled by 6 am, so we still slipped out towards the Washington Canyon where we were met with 15 knot SW winds and a solid 4-6 foot sea. Luckily the sun was shining and fish were biting. We spent the first hours going 4/5 on white marlin. After that we had a mid day lull then I started marking bait around 200 feet that eventually came back up to 50 feet like we had first thing and game on. We proceeded to get lazy teaser bites but none of them really got excited enough to take a bait. We saw at least another 5 whites and a small blue marlin. Fun day, especially only for 4 hours of fishing. Water temp was 81.5 degrees and blue. Most of our bites were in 60-80 fathoms. We are headed into Sunset Marina now and hopefully will be able to slip out tomorrow.